It's that time again and what a treat we have in store at our May meeting. 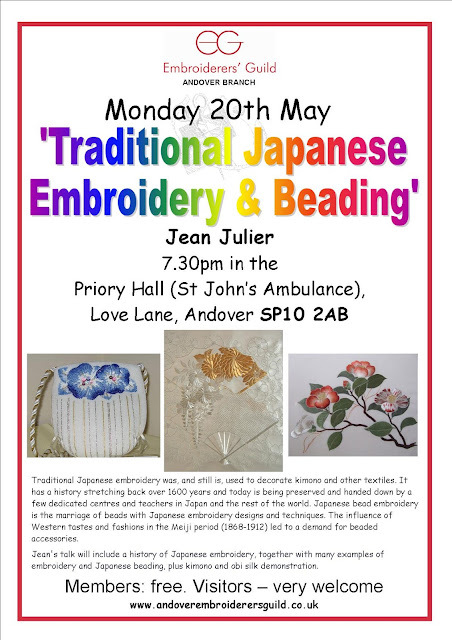 Jean Julier is going to talk about the art of Japanese embroidery. For those of us who went to the 'Threads of Silver and Gold' exhibition at the Ashmolean it will be an futher insight into the techniques employed in these stunning textiles. If you missed it, come and see for yourself how beautiful this embroidery is.